It's now official: just four restaurants in Brooklyn got stars in Michelin's 2014 NYC Guide. There were 67 restaurants total with stars this year, and except for one restaurant in Queens, all the rest were in Manhattan. 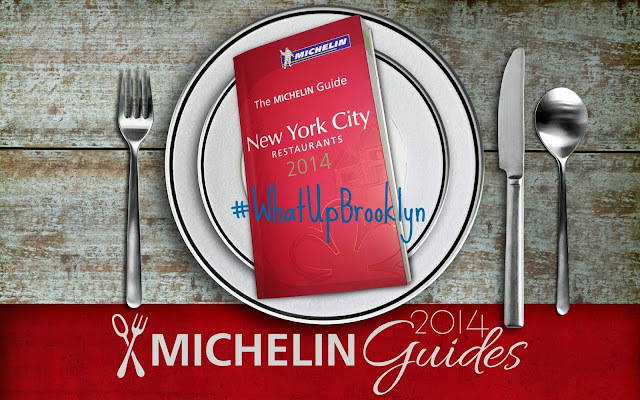 On the one hand, it seems surprising that Brooklyn, which in recent years has grown to become a culinary capital of the world, should receive so little attention from Michelin. Many neighborhoods in Brooklyn, like Cobble Hill and Williamsburg, now have as much culinary talent as any neighborhood in Manhattan. Meanwhile, food-savvy diners are moving into neighborhoods which only a few years ago would have seemed completely inhospitable to forward-thinking restaurants. But now that the demand is there, chefs are responding by relocating to the Brooklyn outskirts to serve that crowd (look at the restaurant boom in neighborhoods like Greenpoint, Crown Heights, Bed-Stuy and Bushwick). But on the other hand, it may be the exact same things that makes Brooklyn less attractive to Michelin's critics that makes it more attractive to Brooklynites. The playful irreverence towards more classical restaurant cuisine — the kind that Michelin critics like and that, for good reason, lives on in many Manhattan "establishments" — is in part what differentiates Brooklyn from the pack. Look at the resume of chefs behind innovative sandwich shops and hip neighborhood joints. Some (not all) have experience at the same places that formerly would have been stepping stones for a stage at Per Se or a slowly-work-your-way-up-the-ladder position at Le Bernadin — look at the teams behind Battersby or Runner and Stone. These do-it-yourself-and-do-it-better Brooklynites are opening their own places and making them accessible and understandable to diners in the way Berkley, CA and Portland were doing years ago – but they're doing so against the backdrop of the culinary standard-bearer "Manhattan." They're more affordable (for now) and more willing to take risks with their menu, design and concept than many Manhattan restaurants. And they're proving, successfully, that innovation, originality and creativity, not to mention great food, come when you no longer hold yourself to the old standard — whether Michelin cares or not.